SPRINGFIELD, Mass. - Throughout the season, the Division 2 Central champion Nashoba Chieftains would use a big third quarter to pull away from their opponents. 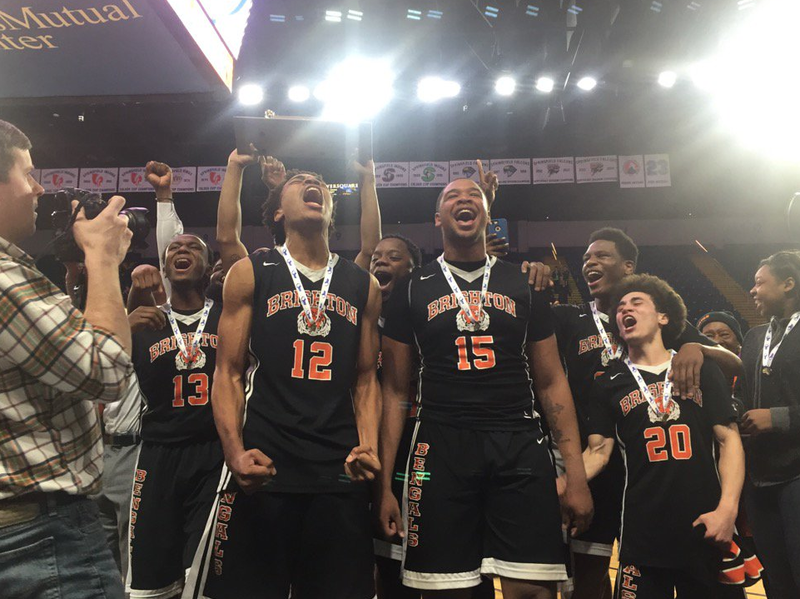 On Saturday afternoon in the Division 2 State final, it was the Brighton Bengals who dominated play in the third period, as they outscored Nashoba (21-4) 24-4 in the third quarter, en route to an 82-58 victory at the MassMutual Center in Springfield. The Bengals (23-5) won their first state championship since 2013, and the second title during the eight-year tenure of head coach Hugh Coleman. Brighton’s third-quarter offense was balanced, as eight different players scored for Brighton during the third period. The Bengals had six players who scored at least nine points in the state final against Nashoba. Coach Coleman said that the Bengals depend on multiple players, including starters and reserves, to get a rhythm going on offense. “We’ve tried to develop our bench so we can go to them, especially if our starters aren’t playing well,” Coach Coleman said after hoisting the state championship trophy with his players. Brighton entered the third quarter with a one-point deficit, which it quickly erased with a rebound and putback by senior Jordan Diaz (9 points, 7 rebounds) and a corner three-pointer by senior guard Jordan Galloway, giving the Bengals a 39-35 lead. The Chieftains cut their deficit to 39-37 when senior Trevor Manyak (8 points) made a layup following a long outlet pass by classmate Andrew Fish (16 points on four 3-pointers). Brighton proceeded to go on a 12-0 run, headlined by hard drives to the basket by guards Willie Veal (13 points), Jordan Galloway (11 points, 6 rebounds, 4 steals) and Johnny Ortiz (11 points, 2 steals), who either made layups or passed it off to forwards who put the ball in the basket. Nashoba head coach Danny Ortiz said that Brighton’s size advantage was troublesome for the Chieftains in the third period. Three of Brighton’s players are listed at 6-foot-6, including Diaz, Jerrod Clark (2 points, 6 boards) and Quincy Taylor (7 points, 8 rebounds). The Bengals outrebounded Nashoba 45-30 on the game. A layup by senior Connor Jesson with 1:44 remaining in the third quarter ended Nashoba’s scoring drought, but the Bengals answered with a three-pointer by Veal and a pair of free throws from junior guard Mykel Derring (12 points, 12 boards). Brighton scored the first four points of the fourth period, including a rebound and putback by senior guard Tyrone Perry (9 points, 3 rebounds) following a steal by Ortiz. A basket by Clark extended Brighton’s lead to 64-41 with under seven minutes remaining in the fourth quarter. The Chieftains climbed back into the contest, however, by going on a 15-0 run, led by junior captain Justin Pierce (team-high 18 points, 7 rebounds). Pierce scored 10 points over that span. An old-fashioned three-point play by Pierce cut Brighton’s advantage to 64-56 with 4:16 remaining in the fourth quarter. As usual, it was Nashoba’s play on defense that sparked the Chieftains, as they held the high-flying Bengals scoreless for nearly three minutes and forced turnovers, which led to layups and open shots. Nashoba never got closer than eight though, as Brighton closed the contest on an 18-2 run, sparked by a layup by Ortiz and a three-pointer by Perry. Nashoba hung right with the Division 2 North champions in the first half, as the two teams went back and forth throughout the first sixteen minutes. Brighton scored the first 5 points of the contest on a three-pointer by Derring and a basket by Diaz. The Chieftains responded with three-pointers by Manyak and Fish. A pair of layups by Taylor opened up a 13-8 advantage for the Bengals, but a baseline jumper by Fish and a three-pointer at the top of the key by junior captain Justin Pierce tied the game at 13. Brighton guard Laqu Howard was fouled shooting a three-pointer with six seconds remaining in the opening quarter. He hit all three shots from the charity stripe, giving the Bengals a 16-13 lead after eight minutes of play. Derring opened the second quarter on a three-pointer at the top of the key over a defender, but Fish responded with a three-pointer of his own. Brighton went on an 8-0 run in the second quarter to open up a 27-21 advantage with three minutes left until halftime, but Nashoba responded with a 9-3 run of its own, punctuated by a corner three-pointer by Fish. Fish hit another three-pointer at the end of the quarter to give Nashoba a 35-34 halftime advantage, but Nashoba would never lead in the second half. Coach Ortiz said he doesn’t want his players to take their experience in the D2 state final for granted. The Chieftains will graduate some key contributors from a team that went to the program's first ever basketball state championship, including Jesson, Fish, Manyak, and Nate Mansour. However, other players, including Pierce and sophomore center Connor Ojerholm, who led Nashoba on defense against Brighton with 4 blocks, will return next season. Pierce said that the Chieftains will be even more motivated to return to the state finals after having a historic amount of success this season, including winning the D2 Central sectional tournament for the first time since 1977. Brighton is a team that has had sustained success under coach Coleman, as the Bengals have appeared in three state championship games and won two of them in the last six years. Now, the Chieftains will look to emulate the Bengals by taking the next step and becoming accustomed to playing in state championship games and, eventually lifting a state title trophy above their heads.